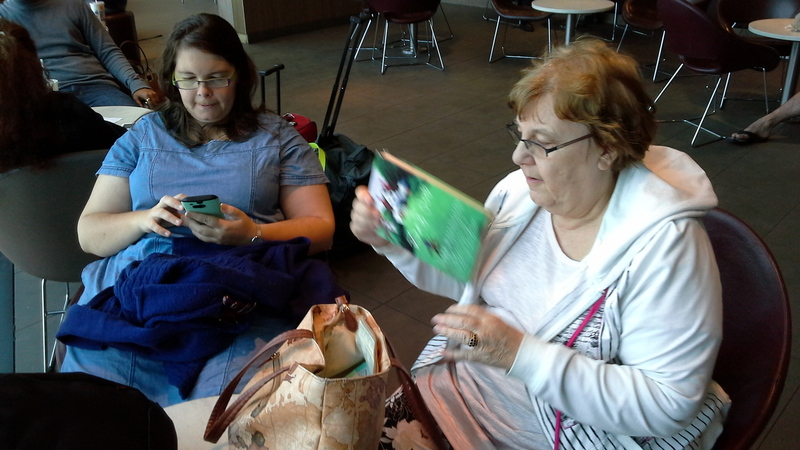 So now we are in the departure lounge waiting for the 6:45pm flight to Chch in about 4 1/4 hours. We had hoped to be able to go into Sydney and do some touristy type things, but after only a few hours of sleep after the over night flight from KL we are seated next to McDonalds (ice cream at 4.00pm) “watching the girls go by” – oops sorry – watching the planes go fly (in and out). Today is the first time we have had any wind to speak of. Dhaka had none, and at KL we were in the building. Though there were some lightening flashes to “light up” our evening meal in the transit termiinal. In Dhaka you could not see a clear sky at all. The degree of pollution ment that the sky was hidden and even if there were clouds, they could not be seen. The sky here in Sydney is high clouds and no blue sky visible. However, it is certainly cooler here – in the mid 20C’s.Nice and comfortable! Wendy is asleep, Anne is on her cell phone doing something on the internet, while I am updating the blog. What are we going to do this coming week back in Chch? Our Quantas flight arrives about midniight, then back to 10 Ajax St, set the DVD to record a rugby match to watch later,and then life will begin to resemble a well oiled machine as we begin to take up the various duties, jobs and responsibilities we have. Chrismas coming up all to soon… Then 2016 and all its possibilities of serving and so forth. Gems had applied toregister their school in 2010. Every inquiry since was met with lost file and hints for bribes. Or redo the file 2cm of paper to redo. During the week R with an English visiter went to see someone higher up in Education dept to discuss bringing outteacher training 6. While there they inquired re Gems Registration. He run down to the lower levels. Answer file lost. The seniorman said very firmly ; find it! And they did and word came they could pick it up on Fridayat 12 oo Thankyou Father for the right man and the file done. Yesterday was busy getting things finished and handed over. We were sad to leave the so were they. Will you come back everyone asked.? Last night wasthe local House Church where we stayed. More friends to see. Wealsogot our bags packed almost nothing to pack. Then we hadsteak and chips our first non curry dinner! We hadt taken the steak over vacumn packed no problem. Amazing. We prayed for each other. It is just on 5.00am and the call to worship has sounded out again. Today we fly home. Where is home? Home is where tha heart is. One of my favourite authors, Paul Tournier, wrote “A Place Called Home”. He spoke aboit our need to be able to live where we are fully and be involved. To find a place of rest in our spirits and not be troubled because we have never ‘left’ our original home. Over the years I, Peter, have left many ‘homes’. So today I leave another home. It is a little sad, and yet also joyful. For I go to another ‘home. A home of long standing. In fact I have never lived in one place as long as I have in Christchurch. And I have learnt to give myself fully in what ever place I find myself. 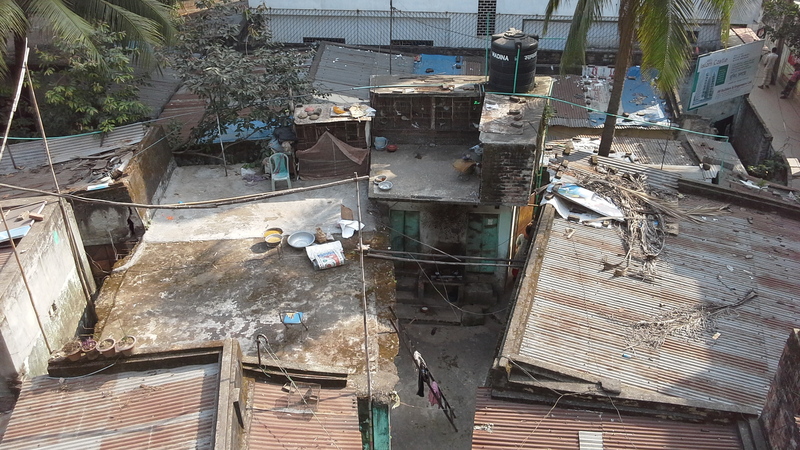 Dhaka has been hot and humid. I have not slept as well asI would have liked. Yet it has been ‘home’. We have been welcomed by R&C, and the family at GEMS, and come to love them all. It will be dificult to get on the plane. There are great needs here. One can do much for the Kingdom. Yet the needs are great everywhere. Our hearts find their ‘home’ in God, so wherever He is, that is home. It is a privilage to find one’s ‘home’ in God. One of the things I did not expect to find here was who my daughter Anne has become. I suppose that like most parents Anne had “never grown up”, as it were. Well, she has been a revelation to me here. Her ability at teaching English, and helping others understand it has been an eye-opener to me. Anne is finding a place for her tallents and giftings. What her future will look like I do not know, but I am watching with bated breadth, as it were, to see who she becomes in God. There is the invitation to return here. We need time to get back into the folw and rytheme of life in Chch before we decide such things. I siad to the Lord some years ago that Ido not need to go overseas again. And now I find this ‘virus’ of mission flares up again. “Help Lord”. We will see. Wendy has done great things in helping the science dept. We will have many things to see to in the weeks ahead. Happily R$C’s son is going to Dhaka for Chtistmas, so we can give him a flash drive of things for them. Now the need to finish packing, get Micheal, the Transend driver, to take to the airport, then customs, immigtation, tickets, and all the various other events of changing countries take place until we again stand on the terra firma of Chch. Thankyou for being part of our adventure and time here in Dhaka. Thankyou for your prayers and support. Sorry about this chief, I forgot to put captions on the photos, so I have correct ed as you see. Today is our last day at GEMS. It will be sad to leave. ,This morning as we were driving from R&C’s place where we are staying I saw many things and sights out the van window. Rickshaws piled high with boxes, or bags, or people. Buses full of men all going somewhere – work maybe? Mini vans, 4×4’s, old cars and new ones, all seeking to get there faster and leaving everyone else looking for the way through the flow. Each one pressing into the available gaps in the traffic. Order in the chaos. 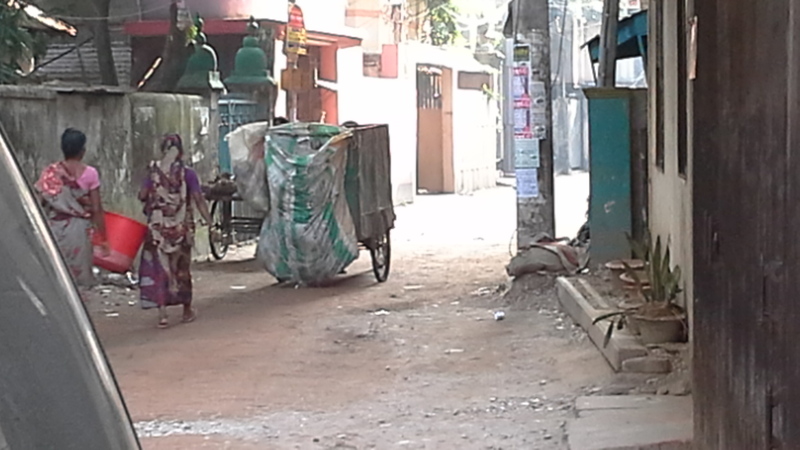 Rickshaws travelling down our side of the road while going against the flow!!!!!!!!!! The occasional woman walking along the footpath. 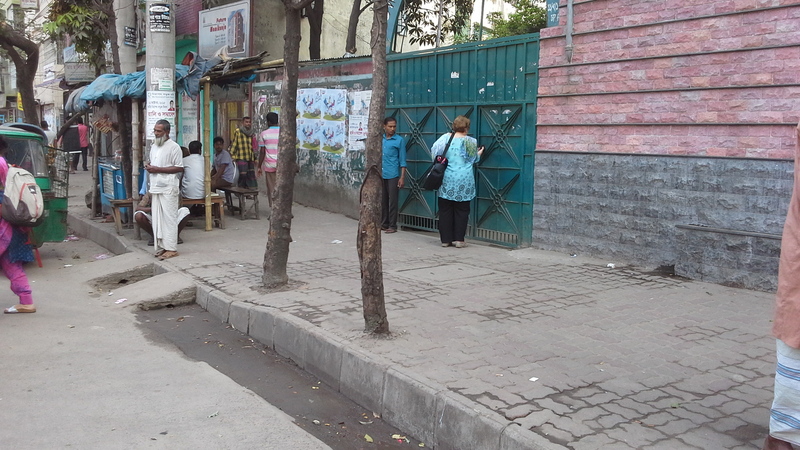 I also noticed about 8-10 women all sitting outside a shop, maybe they were waiting to go into the sewing factory? Other times of being driven round the city I have seem the lean-toos that people use as their homes. Right on the footpath while using the fence as the back wall. One place I noticed about 100 metres like this.While a little while later the big city shops selling new cars, clothing, McDonald’s., and a myriad other items. At school today Anne continues her English teaching, Wendy her Science and I doing the computers, as well as helping teach Excel and Word. The what (little) I know is helping them get better and become more proficient. It is a privilege to be here do what we can. It’s 5.45pm in Christchurch at the moment, we hope you’ve had a good day, and we look forward to seeing you soon. I haven’t written for ages. Yesterday was Monday and usually school but yesterday was a Muslin holiday, so no school. In the morning I spent 2 hours with the school dept telling him about the resources we had brought last year and this year. He also wanted help with Biology reproduction and genetics. Next lesson I will teach his class (our yr11) on human reproduction. After lunch yesterday we went shopping to a Bangladesh dept store that sells stuff made in Bangladesh. They have lots of local cottons and beautiful clothes. We went with our driver who waited for us and brought us back. The roads are very crowded. Rickshaws are everywhere even going the wrong way along a road. One part was very slow because everyone was turning right on a T intersection. Saturday there was a speaker from GB who was here to help with teaching and training. Several mission organisations work together. One group is YWAM. We are bringing home some beautiful shawls made by a YWAMer from Bangladesh to support their Mission work. R our host is writing a huge spread sheet with 100 different mission activities this group do each with all their workers and a projection of the next 5 years so visas can be available for workers from NZ and other places. There are people from Korea and Singapore and Hongkong. We are all well and in good health, enjoying ourselves in this hot and humid place. Yesterday was Sunday. Not Sunday like in NZ where churches meet to worship the Lord, but Sunday that are just like our Mondays. Shops are open, schools begin their week of teaching and life goes on. Here the Thursday and the Friday are the weekend. Still the Christians meet together on either the Saturday or the Sunday – depending on who you are. I volunteered to go and preach at a little church a few days ago, so got my message ready. Then at about 3.30pm set off with the pastor, who had come to a meeting at R&C’s place, in an adventure of a life time. 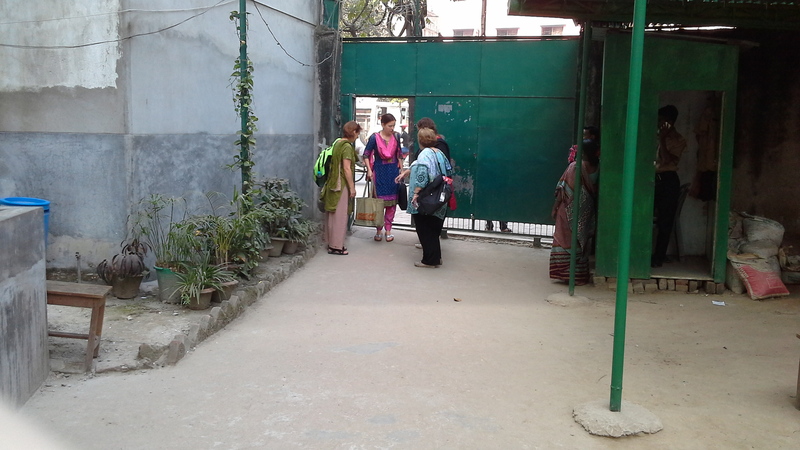 The pastor spoke a little English, and me, wel I spoke no Bangla.There would be a translator I was told. So off Iwent. Notin a nice cool minivan but in a “put-put’, a three wheeled taxi that had all the openings enclosed with metal grills. I could see out, and the wind blew in, but it was still hot and humid. os. The pastor pointed out landmarks from time to time. So I would nod my head as if I understood, which I didn’t. I need my hearing checked when Iget back to Chch. I think the ear infection is still affecting me.. However, the shops and the markets, the piles of rubbish, the people weaving through the traffic, and all sorts of other goings-on kept my attention on the road and the trip. We eventually arrived at the drop-off point. There were people everywhere. Thousands, all going somewhere, all with a purpose, all looking for their homes or places of business. And I not understanding a word. The pastor led me over the dual carriage way, that had some 4 or 5 lanes of traffic, on a foot bridge. People sitting on the side begging, others scurrying along, intent on their own destination, and I looking at everything around, drinking it in as if my life depended on it. Thinking at time, ” Am I a target for someone….? On the other side of the road I followef the pastor across a raillway crossing, happily no trains coming, and in to an area that a tourist would never see. A street market., maybe 10metres wide for the “road” then all sorts of goods for sale. Veggies, fish, steel rods for building, sacks of rice (I suppose), vehicles being repaired. The smells and sights. Chickens sitting docile in cages. All this and more. Hundreds of people were walking around, or sitting in a sort of coffee or tea shop drinking and talking. What do all these people do???? It seemed like sensory overload big time. Suddenly the pastor turned off to the left, and like an obedient little lamb I followed. We walked for about 10 mins through little narrow streets. There are no footpaths here. The building rise 6 or 7 stories straight from the roadside. 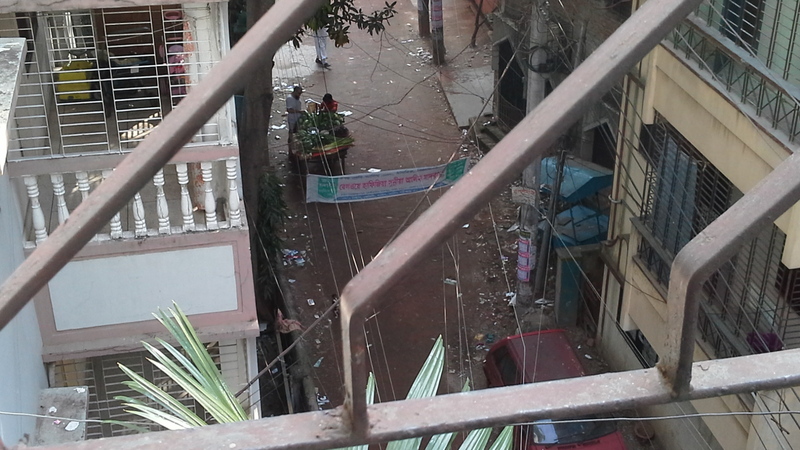 Then there is the odd open space – full of overgrown weeds and rubbish.The ground floor is of shops. 3 or 4 metres wide. Grocers, mini-mini-mini markets, and a myriad other sort of things they sell. Watch your step!!! Eventually we arrived at the church. The ground floor of an appartment block. The pastor and his family live there as well. He has a daughter, who spoke good English, and a younger son. We were about 45 mins early, so I sat and spoke to those who came early. One man said fome a distance to attend. 5.00pm we began, and when I looked round, for I was sitting at the front, the place was very full. Some 23-30 adults, and many children. The first4 45mins was all in Bangla, and I did not understand a word. But God was there. I clapped during the singing and prayed when they did. Then I was asked to speak. A young mancme forward to translate for me. I have been in similar places in other countries. The Lord is there, present, wanting to meet with His people. What a privilage to be able to speak to them the Word of Life! After greetig them I thought “Lord whatI had prepared did not seem suitable, so what di I do!” After what seemed like an age (5-10 seconds maybe), I began and for the next 45 mins, with translation, spoke about how the spirit of God wants us to open our lives to His presence in everything we do. Some spoke English, so when the translator struck a difficult word, they would find the right word. It was wonderful!! God was there. This taking an age to write…. When I eventually left, thepastor took me back to the railway crossing. At the precise moment we arrived to stand beside the road my transport arrives. PTL.Then a long journey back to R&C’s place. Thoroughly blessed by God, more than a lttle tired, but content and buzzing with the goodnes and grace of this amazing God we serve. So, what were Wendy and Anne doing? Out spending my hard earnt money!!!! Well theirs as well. Buying things to take back to Chch for family and friends. It is now 7.24am, and time to finish. Today is going back to GEMS and helping some more as we are able. Then only 4 more sleeps and we fly home. Where is home? It can only be where the presnce of God is, as I feel at home here, content to be in a foreign land telling about this amazing God who cares deeply for everyone of us. Shalom, and peace be with you, today and everyday.